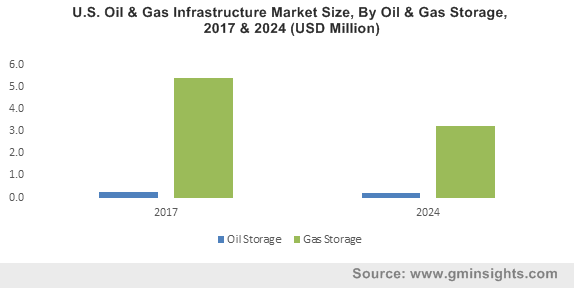 U.S. Oil & Gas Infrastructure Market size in 2017 was valued over USD 70 billion and is anticipated to grow over 1% by 2024. The U.S. oil & gas infrastructure market is set to grow on account of rising primary energy consumption coupled with growing exploration and production activities in the country. Moreover, increasing reliability on oil and gas sector to cater to the growing energy demand will further complement the business landscape. Ongoing exploitation of nonconventional oil and gas resources including shale and tight along with technological advancement for an increased efficiency and production rate will drive the U.S. oil & gas infrastructure market size. Furthermore, ventures to increase crude oil production coupled with increasing demand for light distillates will fuel the industry growth. Abundant availability of crude and natural gas reserves owing to the favorable geographical location of the country will positively impact the oil & gas infrastructure market size. The U.S. holds major unconventional shale plays including Marcellus, Utica, Bakken, Haynesville, Niobrara, Eagle Ford, and Permian. These vast reserves had led the country to be able to become energy sufficient by 2030. Inclination of the country toward natural gas to generate electricity in response to the retirement of coal fired power plants will stimulate the U.S. oil & gas infrastructure market growth. Furthermore, the modification of coal fired boiler to natural gas either to replace or supplement coal as a primary fuel source will positively influence the business growth. Growing measures aimed at maintaining the national security while protecting the economy during energy crisis will enhance growth opportunities for oil storage market size. In addition, the ability to reduce product losses and minimize the chances of fire hazards & environmental impacts will positively influence the product demand. Rising demand for finished petroleum products including diesel fuel, fuel oil, gasoline, kerosene, liquefied natural gas, and liquefied petroleum gas will encourage investment toward refinery sector over the forecast timeframe. Replacements, refurbishments, upgrades, and enhancements in the refineries for the purpose of processing lighter sweeter crudes being developed across North America will further boost the industry growth. 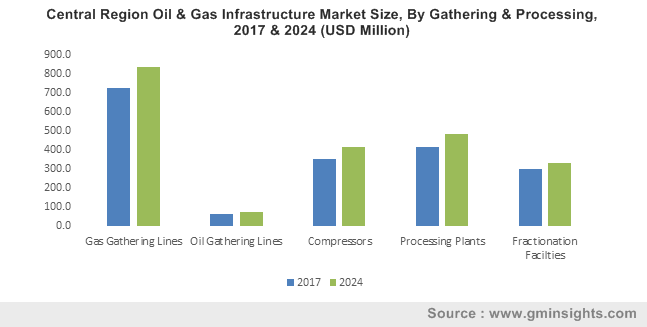 The U.S. Natural Gas Liquid (NGL) infrastructure market will witness strong growth on account of the product’s wide-ranging application across industrial, residential, commercial and transportation sector. The ability of the NGL to provide various end use products and services including plastics, detergent, home heating, LPG, synthetic rubber, gasoline, and solvents, will further drive the demand for infrastructure investment in the sector. The Northeast oil & gas infrastructure market is set to grow owing to the region’s high demand of electricity coupled with favorable environmental policies to encourage shift toward natural gas from coal. In addition, increased access to low-cost gas from regional shale plays have driven the switch away from coal. The Central region oil & gas infrastructure market will witness strong growth on account of the availability of major shale plays in the region including SCOOP and STACK plays in the Anadarko Basin. Moreover, increasing transport in the Central to support imports of heavy crude oil from Alberta’s oil sands will boost the investment across the region. Increasing number of oil refineries to cater to the rise in demand from neighbor country Mexico, will positively impact the Southeast oil & gas infrastructure market size. By 2019, two refineries are anticipated to be online in Texas. The region is expected to witness strong growth on account of the resume of shale drilling in states including Ohio. 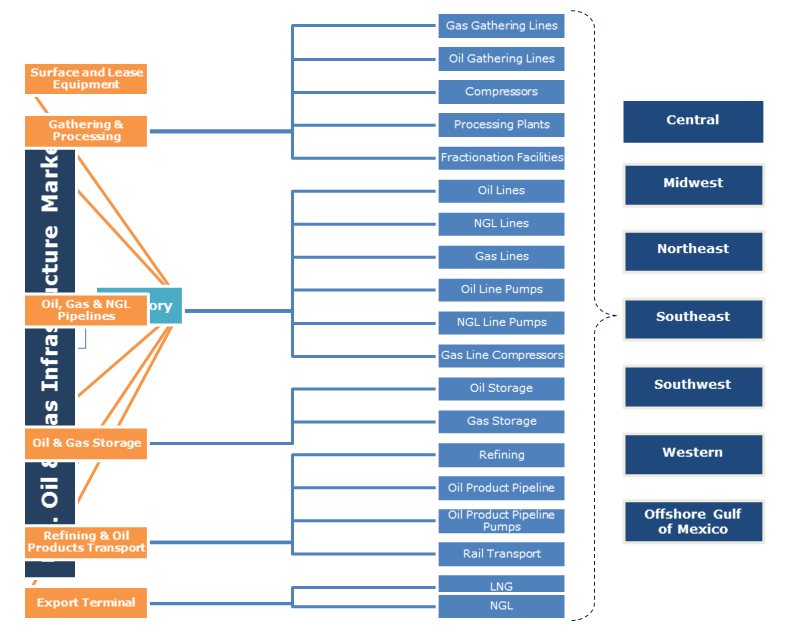 Key industry participants across the U.S. oil & gas infrastructure market include Shell, ExxonMobil, Baker Hughes (GE), Halliburton, Schlumberger, Hatch, Kinder Morgan, Williams Companies, BP, Total, Chevron, Rosneft Oil, Marathon Oil Corporation, ConocoPhillips, Occidental Petroleum Corporation, Cheniere Energy, Energy Transfer Partners, Oneok, DCP Midstream, NGL Energy Partners, Sprague Resources, and Centrica. Strategic initiatives including innovations R&D and collaborations to expand their presence in the U.S. oil & gas infrastructure market. The participants are actively taking part in partnerships and M&As with regional and global vendors to generate the opportunities. The O&G industry requires infrastructure development for the production, storage, and transportation of oil and gas. The surface and lease equipment are the onshore lease equipment and offshore production platforms which have applications across the upstream sector for exploration and production. The other category includes gathering & processing, oil & gas storage, export terminals, refining & oil products transport, and, oil, gas & NGL pipelines. The oil and gas storage are the above ground tank farms and underground storage.